Days of Our Lives (DOOL) spoilers for Thursday, January 25, tease that Abigail (Marci Miller) will confront Gabi (Camila Banus) about her recent threat. After Andre (Thaao Penghlis) stabbed Gabi in the back, she announced that she was going to kill him. Abigail will wonder if Gabi followed through on that promise. She won’t know what to believe since Andre turned up dead hours later. Naturally, Gabi will be appalled by the notion that she actually committed murder. Abigail may point out that she’s done it before. Gabi went to prison for killing Nick (Blake Berris), so Abigail will ask if Andre was her second victim. It’s clear that Abigail’s dealing with a lot of pain and anger right now. She’ll be looking for someone to blame, so Gabi will have to defend herself. Days of Our Lives spoilers say Gabi will shut down Abigail’s accusations. She’ll brush off her threat as a common expression. Gabi simply meant she was going to blast Andre and possibly slap him with a lawsuit. She didn’t have murder on her mind. While Abigail and Gabi face off, JJ (Casey Moss) will gush over impending fatherhood. Lani’s (Sal Stowers) guilt will understandably grow stronger. Days fans know Lani’s lying about this baby’s paternity, but Valerie (Vanessa Williams) suspects the truth. 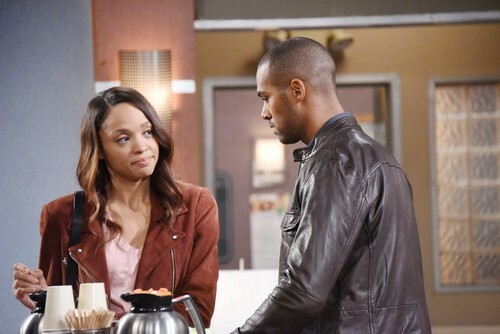 In Thursday’s DOOL episode, Valerie will spill the pregnancy news to Eli (Lamon Archey). She’ll want her son to be in the loop. Eli and Valerie will worry that Lani is fibbing to protect JJ, so expect the drama to heat up soon. Other Days of Our Lives spoilers say Eric (Greg Vaughan) will hide how he feels about Jennifer (Melissa Reeves). He’ll get frustrated over what he can’t have and that’ll lead to a fierce confrontation. Eric will baffle Jen during this intense argument. She’ll be left wondering if he wants her as a friend, enemy or lover. It’s certainly been a confusing time for these two, but Eric and Jennifer just need to try honesty! Days viewers are hoping they’ll get on the same page eventually. We’ll give you updates as other DOOL details emerge. Stay tuned to the NBC soap and don’t forget to check CDL often for the latest Days of Our Lives spoilers, updates and news.